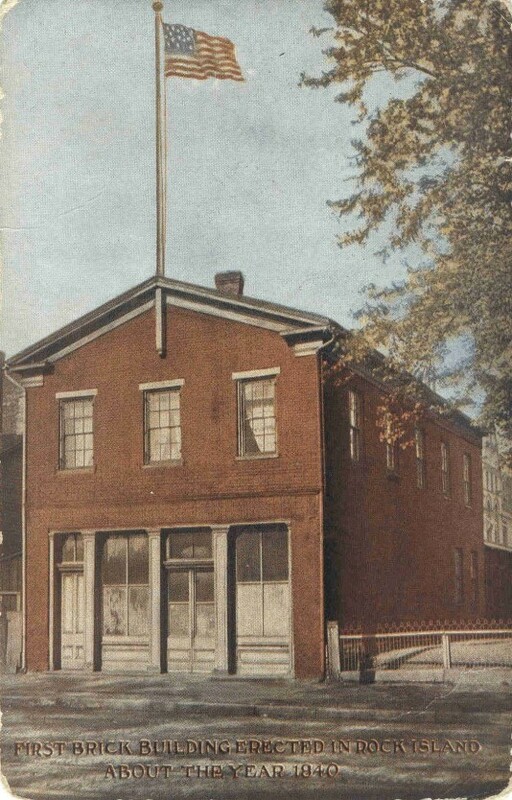 When this postcard, captioned “First Brick Building Erected in Rock Island About the Year 1840,” was published in the early 1900s, the historic store building was still a point of pride. Greg Binder shared this postcard, but the picture has been reproduced many times over the years, even though the building is long gone. This sturdy brick commercial building was constructed across 15th Street from Courthouse Square by Sylvester W. McMaster and Lemuel Andrews. Since there were no brick works in the tiny town of Stephenson at the time, the bricks had to be brought from elsewhere, perhaps by steamboat. The result was a surprisingly attractive building in the Greek Revival style. Notice the “Greek temple” form of the low-pitched gabled roof complete with corner returns. The three front windows on the upper level are uniformly spaced and hold six small panes in each sash. The storefront is nearly symmetrical. Two large windows, each holding four panes of glass, have wooden panels beneath. Between them, and separated by large structural columns, probably wood-covered bricks, is the double-doored store entrance. At the far left, a smaller single door leads to the upstairs living space. The height of the street level openings are uniform, with spaces above the doors filled by glass transoms. At the time of construction, the address was Elk Street, but some 40 years later after streets were numbered it would be known as 209 15th Street. Today the site just south of the former Centennial Bridge Building is a parking lot. Lemuel Andrews was born in 1804 and moved to Rock Island in 1837. Sylvester McMaster, who was 8 years younger and a former teacher, came to Rock Island at age 24 in 1936. The two men quickly formed a short term partnership, erecting this building and opening a general merchandise store. Sylvester left for Galena in 1841 where he remained until returning to Rock Island in 1866. After that time, he did not list a specific occupation, occasionally dubbing himself “capitalist.” He would spend the rest of his long life here, most of it in a big house on the southwest corner of 30th Street and 5th Avenue. He died in 1908, two years after moving to 1030 20th Street, and now rests in Chippiannock Cemetery. Lemuel stayed in Rock Island, where he continued operating the store. He also served as county sheriff in which capacity he oversaw the hanging of the three men who robbed and killed George Davenport. He built a mansion on the north side of 5th Avenue that he would later sell to the prominent Cable family. Lemuel Andrews died relatively young in 1858 and is also buried in Chippiannock. For a time in the 1890s, the Andrews –McMaster building was the home of W. G. and Bertha Roessler who operated Roessler’s German-English School. After Mrs. Roessler was widowed, she remained a resident, while the storefront became a tent and awing shop. Near the end of its years, the building was used by Wm. Johnston for his tin, copper, and sheet iron workshop. A photograph of the building was published in 1915 in a glossy booklet called “City of Rock Island, Illinois.” Available in the historical collection of the downtown Rock Island library, it shows the building looking exactly like it does on the postcard, except for newly painted signs advertising Mr. Johnston’s business. There’s even a fat-tired bicycle parked outside the shop. By 1919, the oldest brick building was gone, probably to make room for the new County Jail, which was completed in 1922. You can read more about Lemuel Andrews and S. W. McMaster in the recently published “150 Years of Epitaphs at Chippiannock.” It was compiled and printed in very limited library editions by the Rock Island Preservation Commission. Containing over 280 pages of well indexed information about many Chippiannock “residents,” personal copies can be purchased through Chippiannock Cemetery. This article by Diane Oestreich is slightly modified from the original, which appeared in the Rock Island Argus and Moline Dispatch on March 4, 2007.